Having this website to hold me accountable for not drawing enough is a good thing. 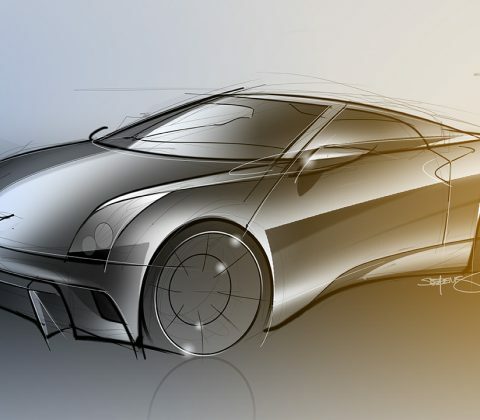 Even though I have been busy working on other projects and I haven’t been drawing as much as I’d like, just knowing that I’ve got a car design and illustration blog gives me the push to keep going. 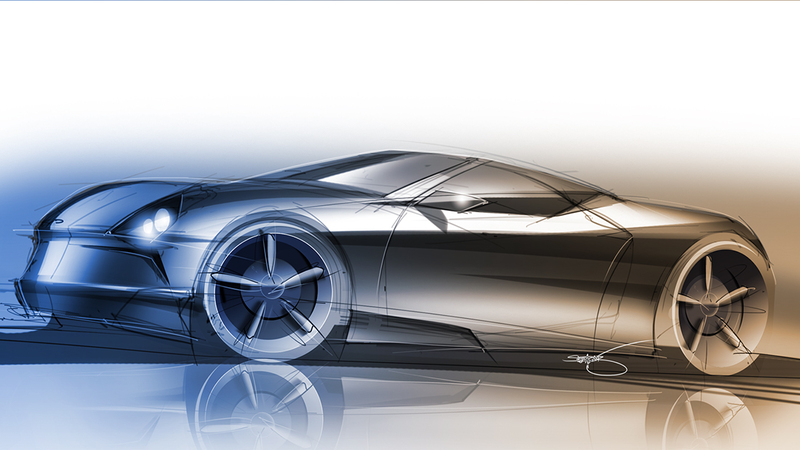 The passion for drawing cars is definitely there – but my time isn’t. There I go making excuses again every time I show up here. “Shut up and talk about the cars already!” is what I envision most of you are thinking every time make a post, so I’ll take your advice and get right to it. 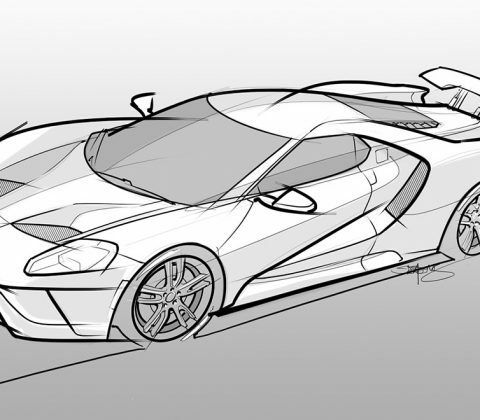 The 2017 Ford GT. This is a car that I’m trying really hard to like, but I just can’t. At least not yet. I may change my mind a bit once I see it for myself (or at least on YouTube), but for now all I see is a sleek looking car with a V6. That’s like something straight out of the 1990’s, and not modern times where it’s possible to buy V8 monsters like 600hp Mustangs and 750hp Dodge Challengers right off the showroom floor. I get why Ford decided to go with a twin-turbo V6. That EcoBoost engine is a lightweight performer that could hang with any V8, no doubt, but…it just doesn’t make the sounds that a supercar should make. Especially one costing over $400,000. 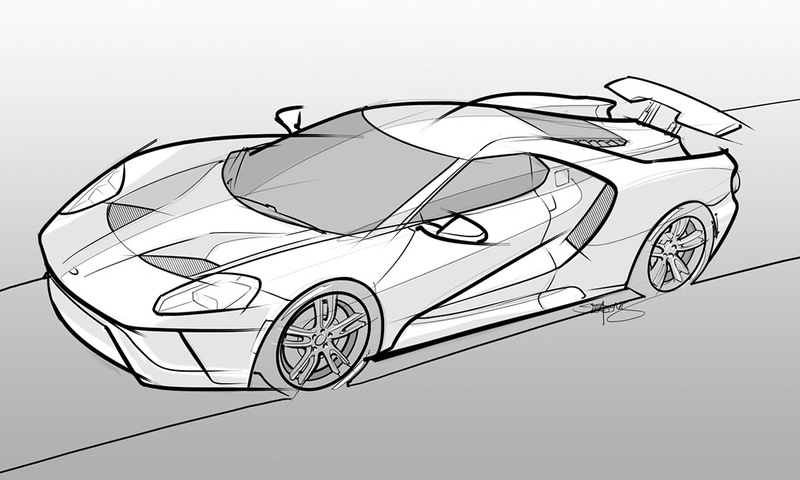 Despite my lack of enthusiasm for the 2017 Ford GT, I decided to draw one anyway. It is a great looking car, no doubt about it. I especially dig the fact that it’s got a different personality from every angle, with all those cuts and scoops and wings coming together in unison to create a very stunning piece of automotive design. 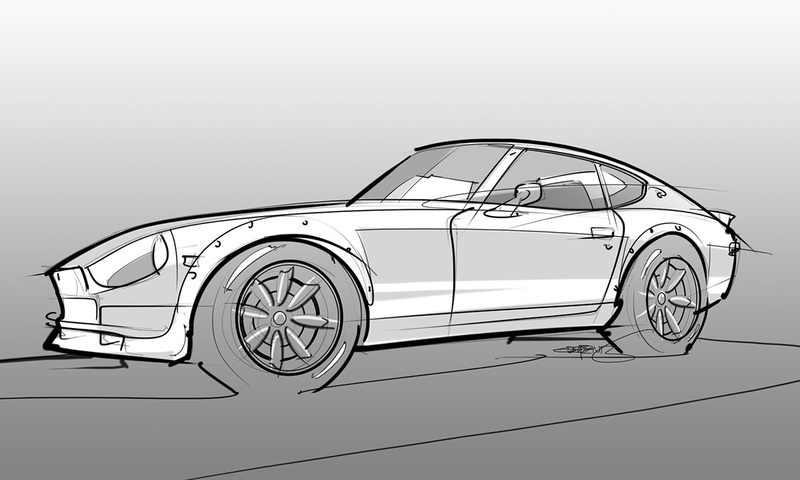 This was a quick 1 hour sketch in black and white, very similar to the style I used on my Datsun 280z, IROC-Z, and Chevy Nova sketches posted a few months ago. It’s a style of illustration that I’m quite starting to like, as it’s fast and loose, yet tight enough to show all the important details. But over the past year or so I’ve seen some beautifully modded Z’s from the late 70’s and early 80’s that are to die for. These cars look fantastic with aggressive wheel and suspension mods, and it’s amazing to think that a simple change like that would make me have a change of heart about a car I disliked so much. Sometimes it’s all about the little details, and I guess I never realized how close I was to liking this car. Proper wheels and tires on these things (with the right stance) is all that’s needed to make me drool! 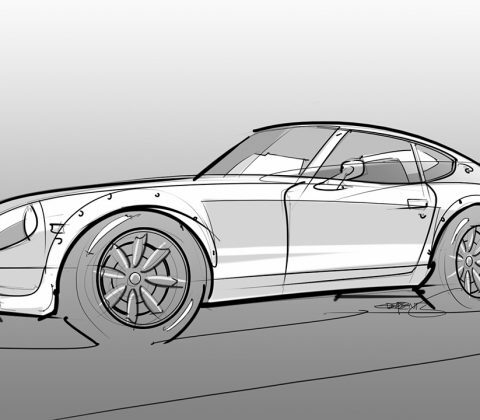 Anyway, here’s a quick sketch of a modded 280z that I found on the internet. Just fast and loose, with no real care taken in trying to get all the little details right. 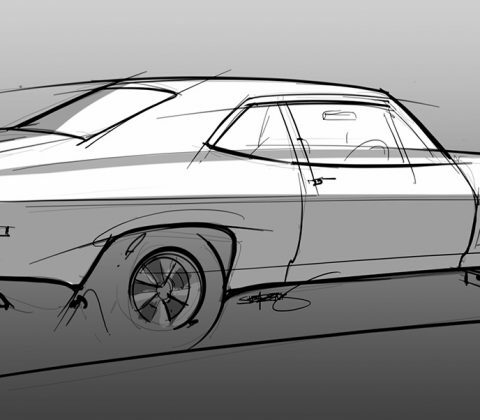 I’m actually finding this style of sketching to be be right up my alley, mainly because I hate getting too focused on trying to make things perfect when I don’t have a lot of time to be drawing cars in the first place. 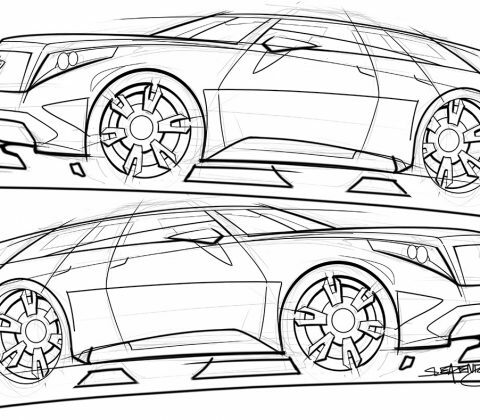 You’ll also notice that I corrected the “thin lines” problem of my previous sketch – and I’m happily back to my thick outlines to define the outer shape of the car. Ahh, the third generation Camaro. The IROC-Z was the dream car of my childhood, and to this day I consider it to be one of the first cars I’ll add to my collection if I ever find myself with the space (and funds) to store lots of cars. My uncle had one of these things, and he let me drive it – which thinking back on it was probably a pretty stupid thing to do. Throwing the keys from a high-performance car to a teenager with only a learners permit makes me shiver now that I’m a 40-something responsible old fart, but I’m not going to lie when I say that it was an experience I’ll never forget! 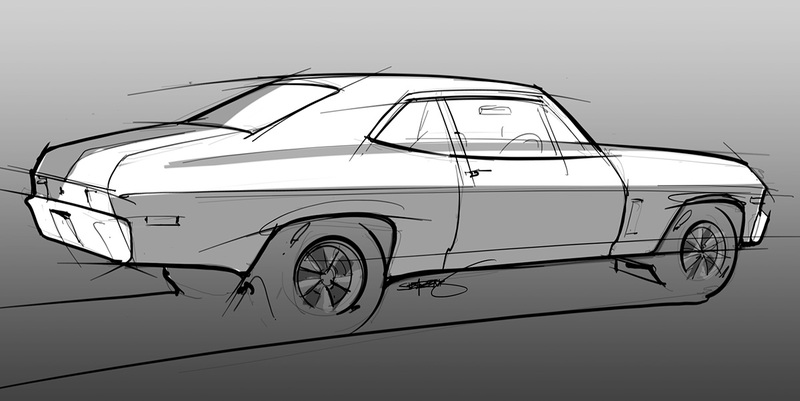 Following right along behind the quick sketch of the 1970 Nova I just posted is another quick digital sketch – this time of a 1987 IROC. Unfortunately, it didn’t turn out quite as well as I hoped it would – but I know exactly why that happened and I’ll be sure to not make that same mistake with my next sketch. The problem was that I decided to make this a very high-resolution illustration (5000x3000px), and the pencil brushes in SketchBook Pro are too thin at that resolution to get the nice heavy outline strokes that I like. The unfortunate result of that is a sketch that looks very thin with very little variance in line weight – a big no-no in my book (line weight is so important!) and I walked away from this one feeling quite unsatisfied. Oh well. Lesson learned. I feel like a total broken record when it comes to drawing cars. It was almost two years ago when I proclaimed that I was getting serious about drawing cars and it was something that I was going to spend a lot more time doing. Well, a lot has happened since then and I haven’t been drawing any more than I hoped I would. That’s life, I suppose, but at least I still have the drive within me to keep this up and to never let go of this passion. Drawing cars has been part of my life since I was 10 years old, and I hope that it never goes away. So what if I take some time off? As long as I keep coming back to it I’m happy. Anyway, I’ve been feeling the desire to draw again recently but the drive to actually sit down and create my own designs isn’t there right now. Drawing cars is one thing. Coming up with fresh new designs is another, and with everything else I’ve got going on in my life right now there’s no “designer” feeling left inside of me. So that means just having fun and drawing existing cars! The Fox Body Mustang GT I drew several years ago was really fun, and the special thing about that sketch was how fast and loose it was. I didn’t have to think much about it while I was drawing it, and that’s the kind of automotive art I feel like doing right now. First up? This 1970 Nova, inspired by the one our neighbors had when I was a kid. That thing scared the hell out of me (loud cars were frightening! ), but nearly 40 years later my memories of that thing are of the fond variety. This digital sketch took approximately 30 minutes to complete, and I did it all in SketchBook Pro and Photoshop. I’ve always been a pretty big fan of the Toyota MR2, as it pretty much represents everything I like in a sports car: small size, great handling, two seats, all with great style and design. I will admit that it’s lack of serious horsepower has always been a bit of a downer for me, because I believe these cars could have been something really special with just a bit more straight-line grunt. What good is flashy good looks if there isn’t enough horsepower to back it up? Despite the lack of power in these cars, I’ve always been an MR2 fan and it kills me that Toyota doesn’t offer one for sale today. I suppose you could consider the 86 as the car filling that gap in the Toyota lineup, and while that’s a fine sports car in it’s own right, it features a front-mounted engine with four seats. This doesn’t quite exactly fit the MR2 mold. There’s nothing quite like the feel of a mid engine sports car, and no front-engine coupe can even come close to replicating it. The designer in me couldn’t resist creating a quick and loose rendering depicting what I think the next generation MR2 could look like. Since every generation of this car seemed too “thin” and light for my tastes, I decided to give it a bit more of a muscular look. Yes, it’s difficult not to go overboard with conceptual designs such as this (especially when market research and project budgets are non existent) but I think I created a design which could be plausible while remaining true to the heritage of this car. On a side note, I feel like I’m continuing to refine my rendering style quite nicely. 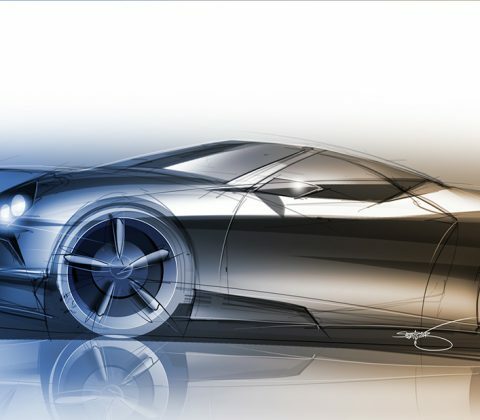 I love “fast and loose” car renderings like this, as they allow for more spontaneity and passion (IMHO) when laying down the lines of the car. 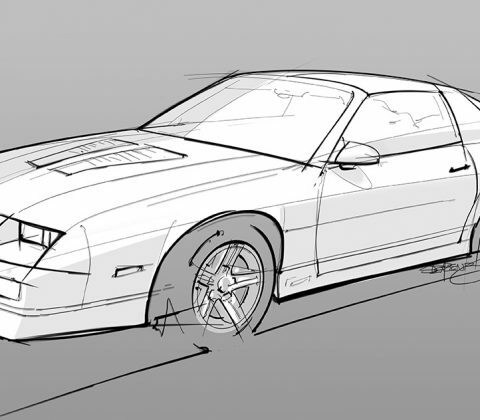 I’ve talked before about how fast thick and thin lines bring a lot of power and motion to an automotive sketch, so I’m definitely trying to keep that going. 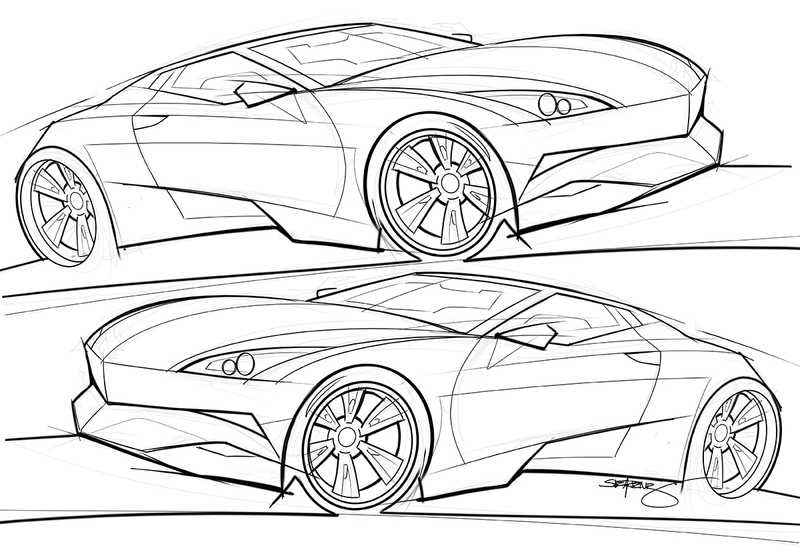 My automotive sketching and rendering schedule over the past several months has been pretty hit or miss, as I’ve been so busy with other projects that I haven’t had much time to focus on drawing cars. Hmmm – seems like I start every blog post the same, right? Despite my lack of posts, the fact that I’m here (and that I always return) gives me confidence that I really am in this for the long haul. Shortly after my last post, I was working really hard on refining my rendering technique. I didn’t post any of that work, mostly because I it was all very messy experimentation in an effort to try and figure out how to render cars again. I’ve been doing black and white pencil sketches for so long that I actually forgot how to apply color and reflections to the surface of a car! To say that was frustrating was an understatement – it was only a few short years ago that I felt like I was making strong progress with my automotive rendering technique, and the feeling of having lost ALL of that skill in that short amount of time was incredibly frustrating. Here’s the line drawing, just so you can see what it looked like before I started adding color and reflections. This lack of sketching and rendering over the past several months has been slowly eating away at me, so I decided to sit down this weekend and do a quick illustration just to keep my hands trained. As a matter of fact, I didn’t even intend to do a full rendering – it just sort of happened as I got more and more excited about the fact that I was drawing again! Anyway, the design of this car isn’t really the point of this post. 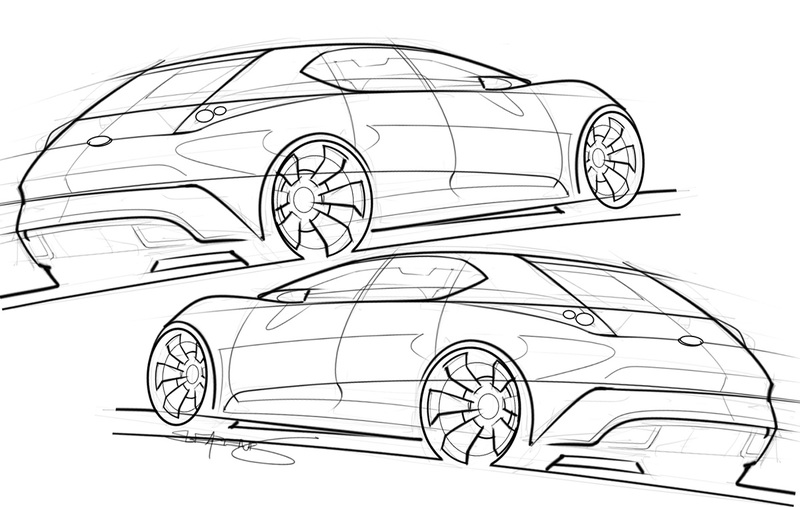 I just sketched the first thing that came to mind, which happened to be a small sport coupe with very similar lines to the Nissan 350z and Infinity G35. This may or may not have been influenced by the fact that I’ve been itching to get a 350z again (I owned one for 6 years), so I guess I’m not totally surprised with the result. 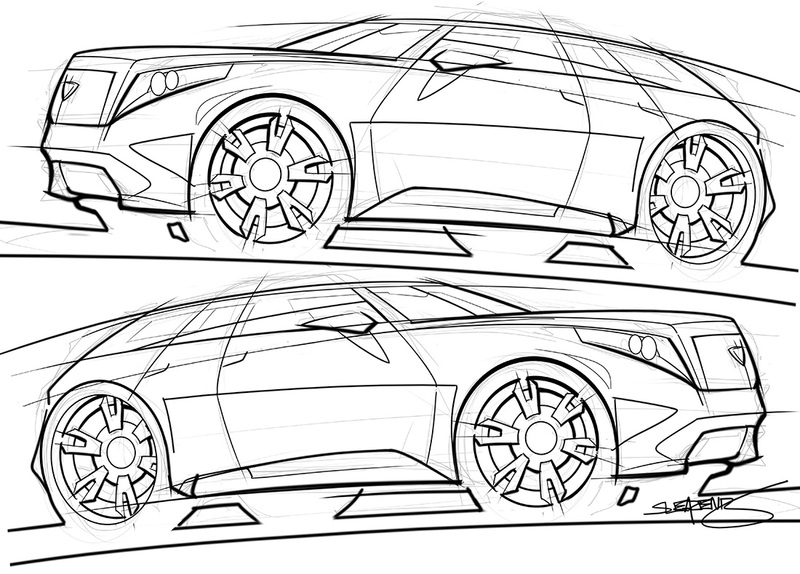 I really hate to admit this, but I am completely and totally stuck in a rut right now when it comes to drawing cars. 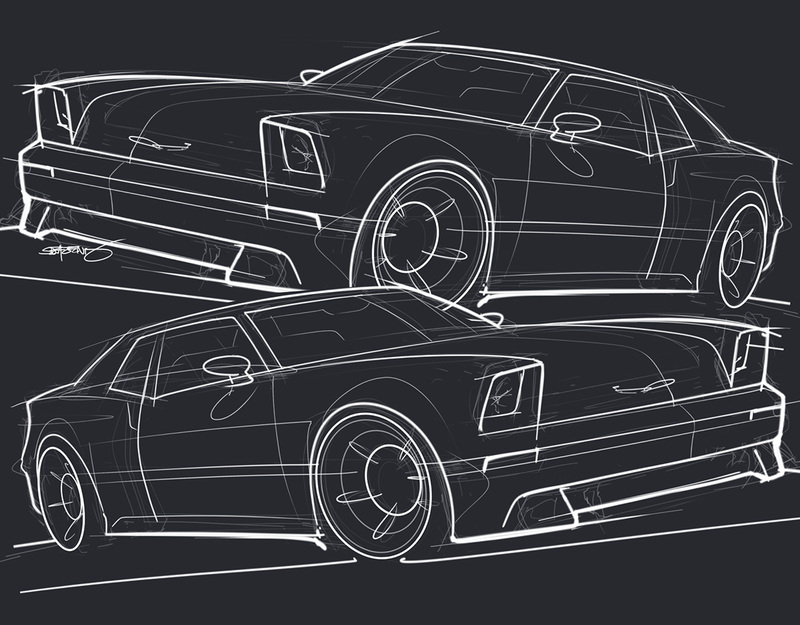 Sure, I’ve been drawing a lot lately, but man – every car I draw seems to be the same thing over and over again – and quite frankly I’m getting a little tired of it! You may have seen my recent post about the truck and SUV concepts I’ve been sketching lately, and the whole reason for drawing trucks like that was to break out of my comfort zone and draw the kinds of vehicles I don’t normally draw. In an effort to force myself away from the typical sport-compact coupes that I normally draw (over and over again), I’ve been continuing on with the truck theme really hard. 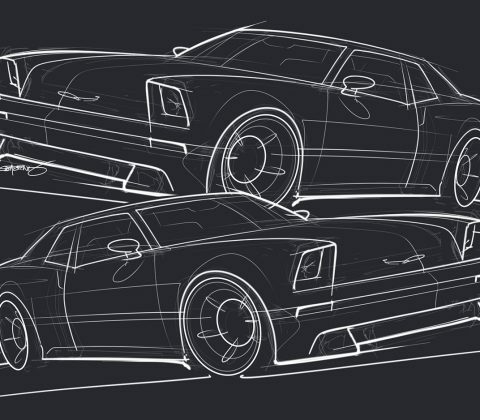 Yes, I’d much rather be drawing low-slung sports cars – but I’m not going to progress as a designer until I can feel comfortable drawing anything without worry of it slowly morphing back into a sports car the more I refine it. I don’t normally start with a firm idea when sitting down to start a new concept sketch, but this time I clearly decided that I wanted to draw a small sport utility vehicle as I put pen to paper. Long story short (and as you can see), this ended up turning into a large Cadillac SUV complete with 24” wheels and an aggressive sports-car stance. Crikey – even my big trucks end up looking like sports cars! But as I’ve said a million times before: practice, practice, practice. That was my whole motivation for starting this blog in the first place. I needed a place to put my sketches and renderings in a format where I could easily track progress and growth. I’m getting there…slowly but surely. 25 years later, I still don’t have a Trans Am. Not that I can’t afford it, but somehow I turned into a Ford Mustang guy and ended up owning several of those along the way. I even have a Mustang in my stable today – but sometimes I do wonder if I’d be driving a Trans Am if Pontiac were still around today. The Camaro is still alive and kicking, and I do admit that it’s a sharp looking car that I’d be very happy to own. 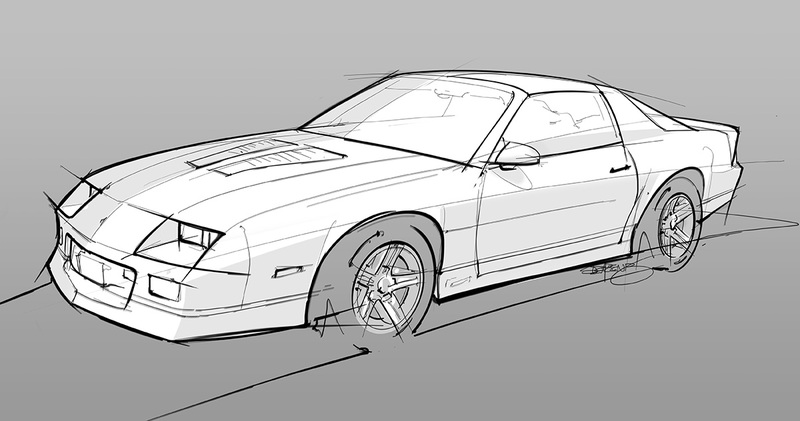 Every now and then, the nostalgia vibe grabs hold of me hard and I find myself drawing concepts for what a current generation Pontiac Trans Am might look like. 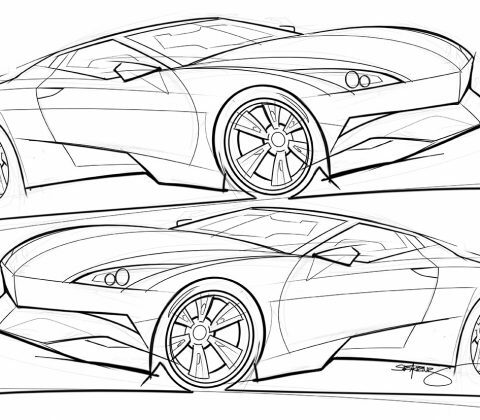 The last generation of this car ended up being too large and fat for my tastes, so for this sketch I focused on keeping the overall size very small and the shapes pointy and sharp just as they have always been. I realize that I probably went overboard with the overall shape, but after all – this is a quick concept sketch so I wasn’t too concerned with the details. Like all my recent sketches, this one was drawn entirely in Photoshop with my Wacom Intuos 5 drawing tablet. I’m still trying to break out of my mold of drawing the same cars over and over again, and I’m not going to lie when I say that it is a really difficult habit to break! Even when I was a child I was drawing pretty much the same car over and over again, and nobody ever really called me out on that until my freshmen year of design school. 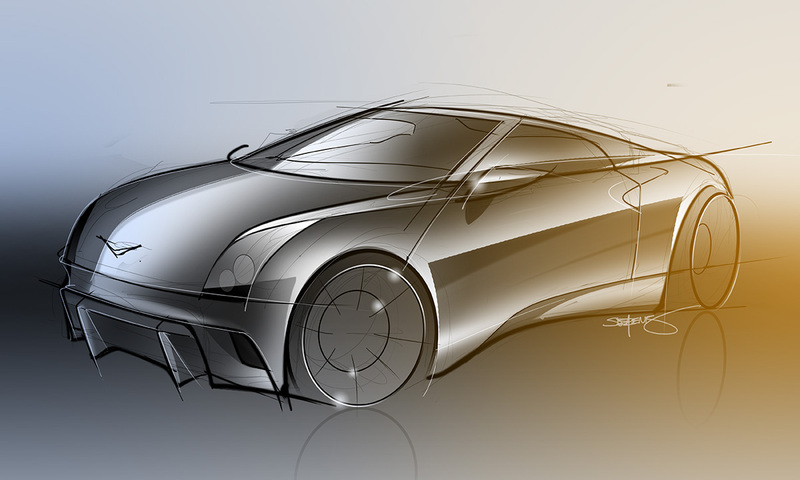 My professors were really tough on me, and I thank them to this day for challenging me to think outside the box when it comes to automotive design. Now 20 years later with nobody else to guide me, I have to keep myself on track and focused if I want to get any better at this kind of illustration. Anyway, here are some sketches of a small car (it’s more of a hot hatch really) that actually started life as a small electric vehicle for urban environments. 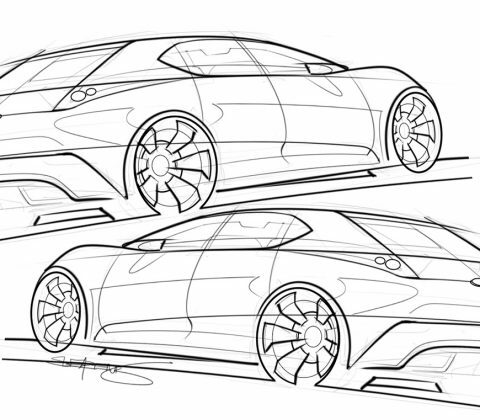 The proportions grew larger and larger as I refined the sketch – and it was quickly turning into a sport coupe – but I forced myself to stay true to the compact/small car genre as best I could. Did I succeed? Well, I am happy with the sketch. But I’m not totally happy with the way it evolved into something entirely different than what I had originally intended to draw. That’s a very difficult part of art and design that many artists won’t talk about, but I’m not afraid to put everything out on the table for this blog!